Faxes, pagers, email, instant messenger, channels – each have been the progression of business collaboration. In the timeline of business communication – from fax, to email, to cloud computing – each new technology evolves to be better and more helpful than the last at sharing documents, completing projects, or asking colleagues for advice. Three main trends have driven the majority of improvements in this space: personal tools inspiring professional tools, a hyper-competitive race to be faster and more productive, and a yearning for truly constructive, inclusive, informed and effective teamwork. Now, the convergence of these trends has inspired the development of a new set of enterprise applications – collaboration hubs – that are vastly reducing time spent sending email and, by 2025, will likely become the primary way we work. A trendy phrase – “consumerization of IT” – describes how the technology we first adopt at home or school paves the way for improvements in workplace technology. This trend is not new. Take web portals and social networking sites, for example. In the late 90s, consumer portals like MyYahoo and MyMSN pulled customizable information from disparate sources into an approachable, always-updated personal site. Shortly thereafter, corporate portals sprang up to store and share proprietary information among employees, for the first time introducing workers to all the information needed to do their jobs from a single access point. Some years later, consumer social networking tools like Facebook and Twitter laid the groundwork for professional platforms like Yammer and Salesforce Chatter, which brought the ease of personal networking and information sharing out of the home and into the office. What’s changed recently is our use of consumer tools such as Lyft, Kayak and Dropbox in the workplace. Enterprise software is no longer inspired by consumer software; instead, professional apps need to compete with the utility and usability of personal apps on our smartphones. Yet despite the near-magical power of email, it still wasn’t fast enough. Instant messaging applications like AOL Instant Messenger and Yahoo! Messenger enabled live, casual conversations between friends and family, and soon people expected the same of their coworkers – thus, corporate IM was born. IBM first introduced corporate IM with Lotus Sametime, then Yahoo announced a corporate instant messaging version of Yahoo! Messenger as part of its enterprise portal business. Soon thereafter AOL responded with Enterprise AIM, then Microsoft unveiled MSN Messenger Connect for Enterprises. By the end of 2002, an Osterman Research report found that 82 percent of all organizations were using some sort of IM application. Instant messaging meets our needs for real time one on one, or one to few, communication, but falls short for group real time communication. Concurrent with this rise of instant communication was the creation of team collaboration tools. This software sought to combine the best bits of the technology that came before it – databases, email, portals, wikis, social – and capture what has proven to be an elusive goal: truly effective teamwork outside the top-down information sharing model. In the 1980’s, as corporations were rolling out personal computers, email was the medium for connecting people, departments and information spread across the company. By their very nature (even the word itself) “inboxes” created information silos. Lotus Notes was the first to bring email, phone books, and document databases into a single environment. Despite being difficult to use (and initially only compatible with the IBM operating system), Lotus Notes sparked the idea that successful, globally adoptable software doesn’t need to be functionally siloed, and that digital platforms were in everyone’s future. In the late 1990’s, a slew of enterprise portal vendors aimed to solve email’s siloed nature by centralizing information and application access through a vendor agnostic approach. The shortfall of portals was the heavy cost of customization and content curation. Wikis, which allow anyone to add, delete, or revise content on any topic using only a web browser, were first built to help virtual teams research, brainstorm, and collaborate. In the early 2000’s, soon after enterprise portals proved to be too rigid for team or project-based collaboration, the concept of wiki’s or communities spread in the workplace via applications such as Jive and Microsoft SharePoint. Wikis created the model for topic-based information dissemination – multiple people communicating in different groups organized by team, topic or project. Curating information was easy but searching across the hundreds or thousands of communities within an organization was deeply flawed. At the time, the common joke was that if you want to secure a document, upload it into SharePoint, no one will be able to find it. Around 2010 vendors like Yammer and Socialcast popularized enterprise social networking as a means to share and find relevant corporate information through a central activity stream. These tools brought a sense of fun to the workplace with easy sharing of pictures and video but lacked practical workflow support and efficient archival search. 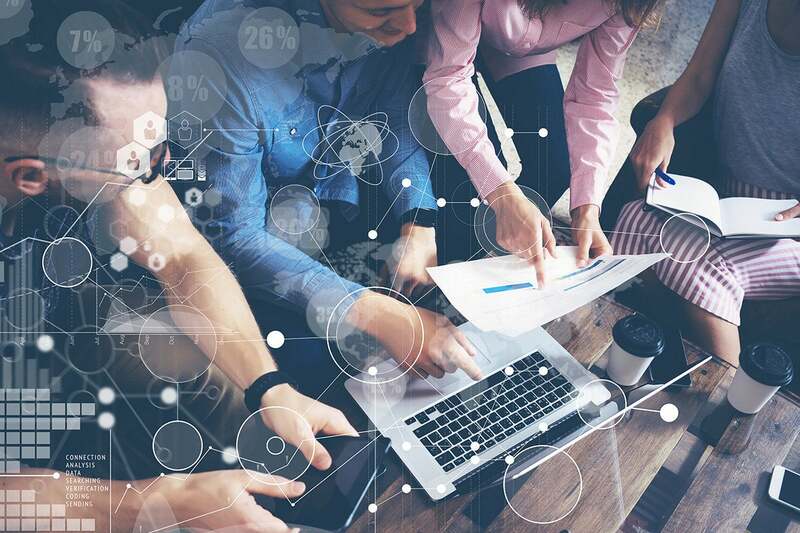 For enterprise technology to be truly collaborative, team members must be able to work creatively, in real time, quickly switching between various projects or topics, connect to a vast set of enterprise applications and data and effortlessly recall information. Channels, a core innovation of new collaboration hubs, describe the place where multiple people can communicate and learn in groups organized by team, topic or project. For example, one could create a channel for the accounting team, where accounting conversations and files would live together. One could also organize channels by project – like for a product launch – so that everyone involved in an initiative has a single place to share their work and track the work of others. One could similarly organize channels by subject matter, so people specializing in one aspect of the business have their own space for discussion. This facilitation of teamwork has Wiki genes, but reflects the conversational way that people actually work. With channels, team members are never left out, and information doesn’t get lost – everything a team needs is in the same place. Channels make it possible to share, archive, and search; to keep information organized, updated, and transparent, taking inspiration from 90s-era corporate portals but with a far better experience and far more functionality. Channels become an even more critical hub for employees’ workflows when integrated with other popular workplace apps like Google Drive, Zoom, and Envoy. Through these integrations, employees can pull reports, start calls, file tickets and more, all within modern-day collaboration and communication tools. Plus, thanks to artificial intelligence (AI), if information is posted in public channels, it can be parsed to better understand what's going on in an organization. AI can point people to messages that might be of interest to them, or suggest channels that might be beneficial to join, all in the service of making the workday simpler, more pleasant, and more productive. The historical advances we've made, driven by the desire to improve collaboration and productivity, have led us to today, when it's possible to share, archive and search to keep a team organized, up-to-date, and on the same page. With channels, the right people have the right information when and where they need it, and collaboration becomes much more efficient and effective. Faxes, pagers, email, instant messenger, channels – each have been the progression of business collaboration. By 2025, everyone will be working on platforms that offer this functionality, or something similar, because channels are the best place for work to happen. Ilan Frank, a veteran of SAP, brings more than 20 years of experience in the collaboration and business communication space to his role as Director of Product, Enterprise, at Slack. At Slack, he helps bring organizational transformation to some of the biggest and most influential companies worldwide, from Capital One to IBM.